We have captured that long time loved flavor of food being cooked on a rotating spick over an open flame.If you want this deep into your food with out those hours of cooking you have made the right choice. Our Bird Booster Chicken injection is the best injection on the market and comes with a free scoop in every jar. 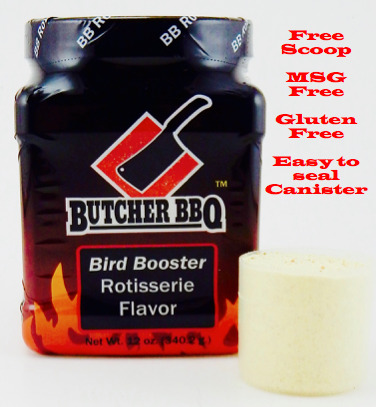 Bird Booster injection was used to win the 1st World Food Barbeque Championships. Injecting chicken is an easier way to get a deep natural flavor and moisture in the meat, without the mess of soaking in a brine. Pinpoint flavor right where the judges taste it. It also helps against over cooking small pieces where the window of over doneness and drying starts. We have been able to get you the all moistness and flavor in a bag that anyone can use. Mix 1/4 cup of Bird Boosterwith 2 cups of water. Use a kitchen injector and inject thru out the white meat or dark meat. Be sure to get it all the way to the bone. While injecting be sure to move the needle around the meat. This amount of product will do 10 pounds of meat. A 12oz bag will do well over 70 pieces of chicken.